After scoring 997 points out of 1000 in concours judging, this stunning example of late ’50s automotive art, acquired from the prestigious Ron Pratt collection, now rests comfortably on its laurels in the Ken Nagel private collection. Assembled in St. Louis, Mo in March of 1957 fitted with the “evergreen” 283 ci/245 Hp V8 engine built February 21, 1956 in Tonawanda, NY, sporting twin Carter 4 barrel carburetors capable of feeding about 760 cfm, topped with the famous “batwing” air cleaner, Power Glide transmission, Posi Traction rear end, then sprayed glossy Matador Red with a red interior with silver seat inserts, this car was indeed sparkling from the very beginning. 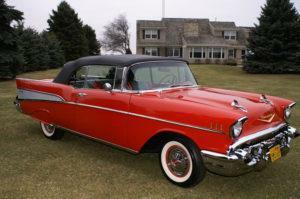 For 1957 Chevrolet made a whopping 47,562 Bel Air convertibles. By all accounts the car was an immediate success becoming an instant classic and the iconic image of ‘50s era cars. 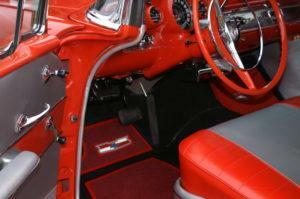 Chevrolet made available 16 solid color combinations and 15 two-tone color combinations. 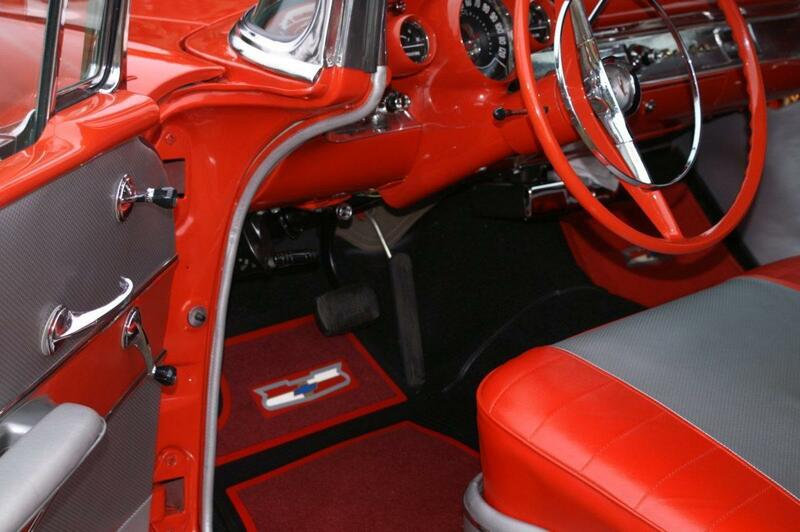 When asked why he made so many different color combinations available on the 1957 Chevrolet, Ed Cole replied, “It will take more than styling to sell cars”. And, he was right. Matador Red, especially on a Bel Air convertible was very popular. For well over 50 years the ’57 Chevy has occupied the lofty status as the standard bearer of what the perfect ’50 automobile embodies. Because of the very high production figures and enormous popularity thousands of examples, in a wide variety of condition we might ad, remain alive and well and are frequently seen at local cruise nights, shows and elegant concours events across the country, never failing to draw admiring onlookers. 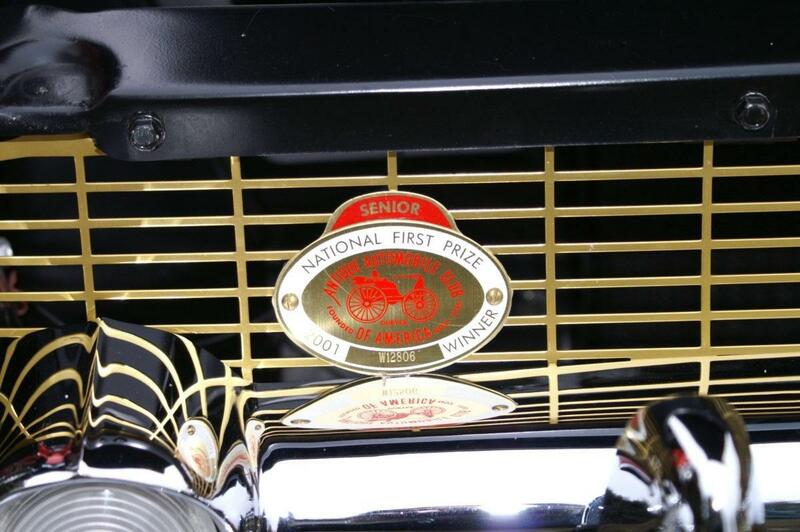 So, how does one car manage to rise above all the rest to distinguish itself and become a nationally recognized example of the best of the best? After undergoing a frame off concours quality restoration done by Dave Klingele for Darry Schnelle of Ursa, Illinois that brought this matching numbers car back to the moment it rolled on to the showroom floor, the car traveled to 11 states where it was shown to the public at some of the most prestigious venues in the classic car world. 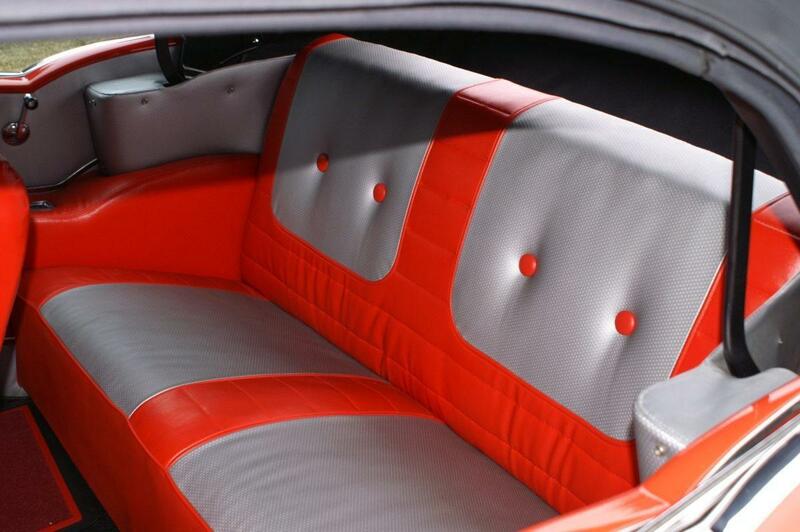 The result is perhaps one of the most decorated ’57 Dual Quad Convertibles in the country. The list of awards is truly impressive and confirms that this car without a doubt belongs on a very short list of the “best in existence”. 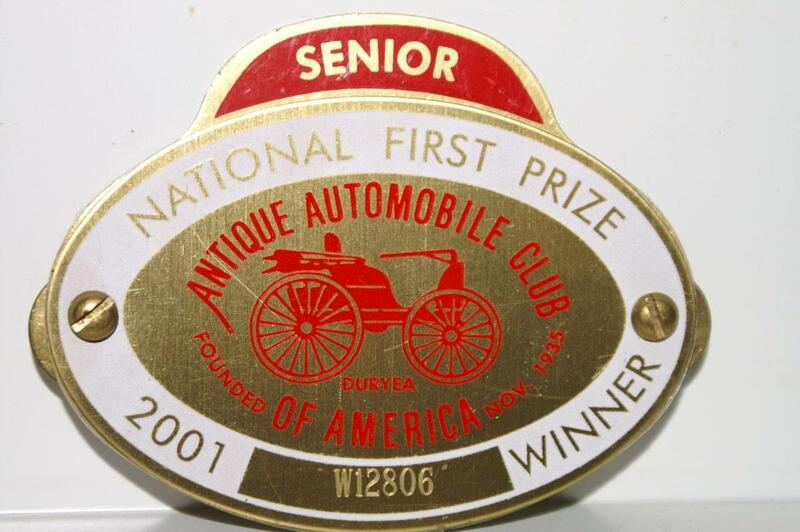 Antique Auto Club of America (AACA) awards include Junior, Senior, Preservation, Grand National second place, as well as National Award Winner of the prestigious Hershey Chocolate Town Trophy. 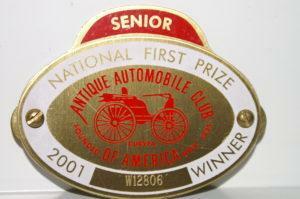 Honored by the Vintage Chevrolet Club of America (VCCA) with Junior, Senior, Preservation awards and ultimately scoring 997 points out of 1000 in concours judging. Chevy-Vette Fest Gold Spinner Award. This beautiful classic Chevrolet convertible is correct in every way including the original Dual Quad carbureted 283 engine. 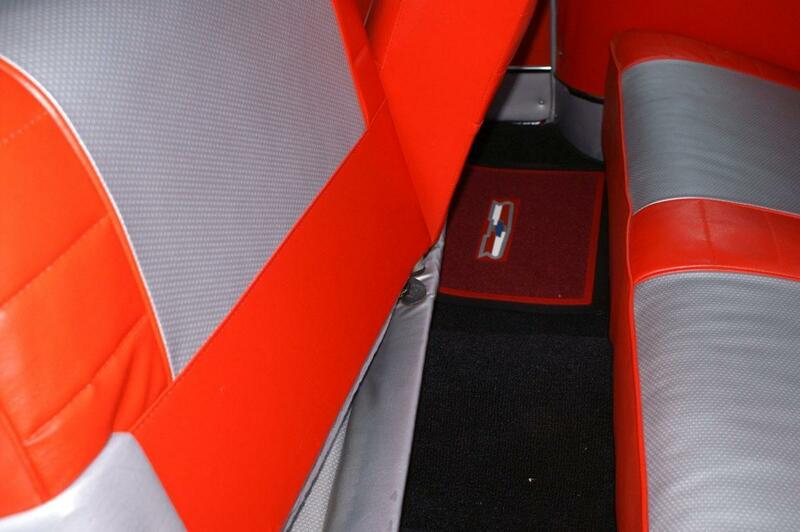 It is equipped with over 30 GM options most notable and rarely ever found are the clever Vacuum Ash Tray that is powered by intake manifold vacuum and a Remington Electric Shaver! 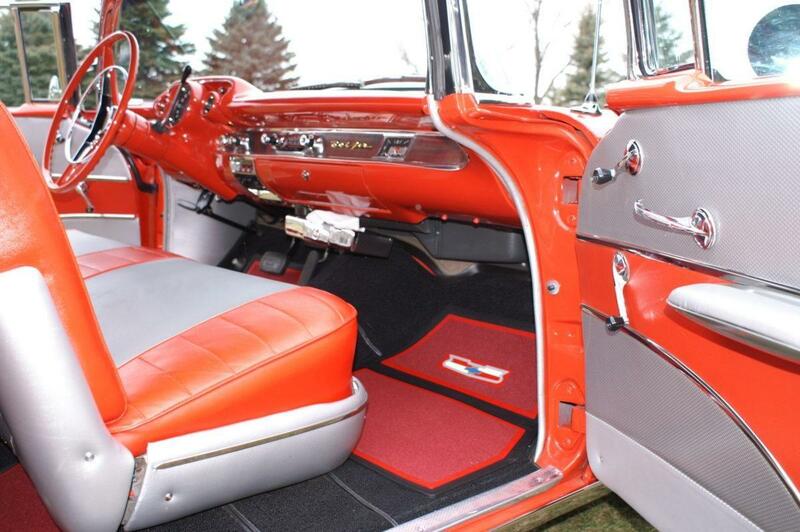 It is easy to understand why Ken’s classic Dual Quad Bel Air convertible is considered to be one of the best in the country. 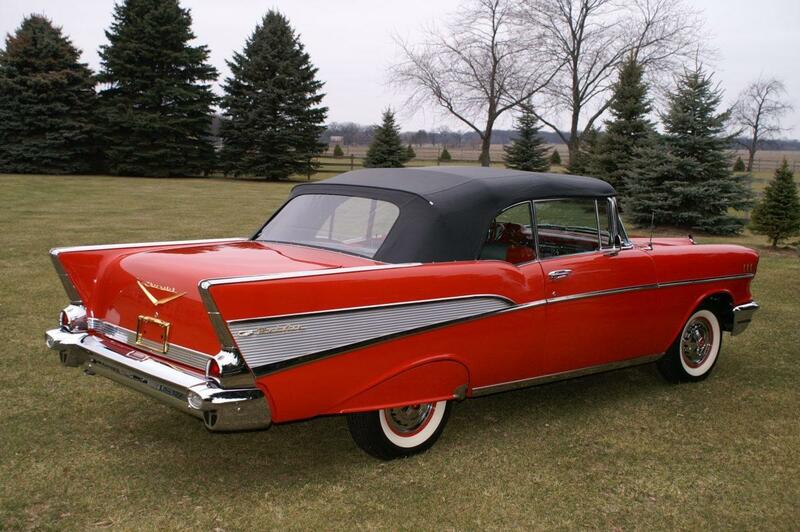 The ’57 Bel Air convertible was the showcase for Chevrolet’s styling and performance leadership. The Bel Air struck just the right chords with the public, who loved the basic car’s modern design and wide range of appearance, convenience and engine options. What’s hard to believe is that Ford out sold Chevrolets back then by 170,000 units. 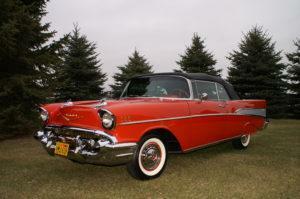 The ’57 Chevrolet Bel Air embodies the best of fifties-era American automotive styling. 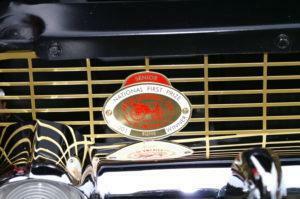 Its form and details are symbols of an automotive golden age. Though based on the 1955 and 1956 “shoe box” cars, on the outside the Bel Air was distinguished with more chrome and featured a golden grille set off with a heavy chrome bar that included parking lights. Riding new 14-inch rubber, Chevrolets stood 2.5 inches longer and 1.5 inches lower than previous models. Twin lance-shaped windsplits down the hood substituted for the customary hood ornament. The rear fins were capped with chrome moldings and highlighted with anodized aluminum side trim panels. The fuel-filler door was concealed in the left rear chrome fin trim, a small but convenient detail that helped clean up exterior lines. The Bel Air was called by some a “baby Cadillac” partly because of the cost and partly because of the many similar styling cues to the Cadillac’s of the time. A basic Bel Air convertible started out at $ 2,511. But after loading it up with an endless list of “must have” options the out the door cost soared to $ 4,142, just $ 555 less than a Cadillac. 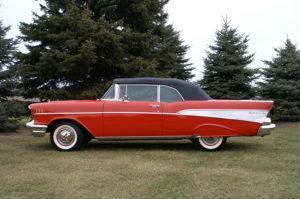 Among the styling features Chevy copied was Cadillac’s method of exiting the exhaust thru openings in the rear bumper. That feature, however, was abandoned because of the exhaust residue that formed on the bumper leaving the Chevy bumper with two blacked out vestigial exhaust ports. 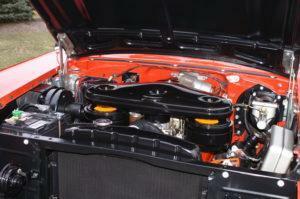 The basic Chevrolet small-block V-8 design has remained in continuous production since its debut in 1955, longer than any other mass-produced engine in the world. 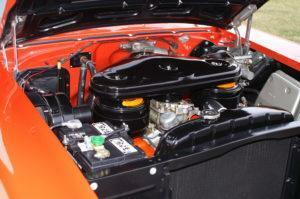 In all, over 90,000,000 small-blocks have been built in carbureted and fuel injected forms since 1955. Production of the original small-block began with a displacement of 265 cu in (4.3 L), growing incrementally over time until reaching 400 cu in (6.6 L) in 1970. Several intermediate displacements appeared over the years, such as the 283 cu in (4.6 L) that was available with mechanical fuel injection and twin four barrels capable of feeding about 760 cfm, the 327 cu in (5.4 L) (5.3L), as well as the numerous 350 cu in (5.7 L) versions. 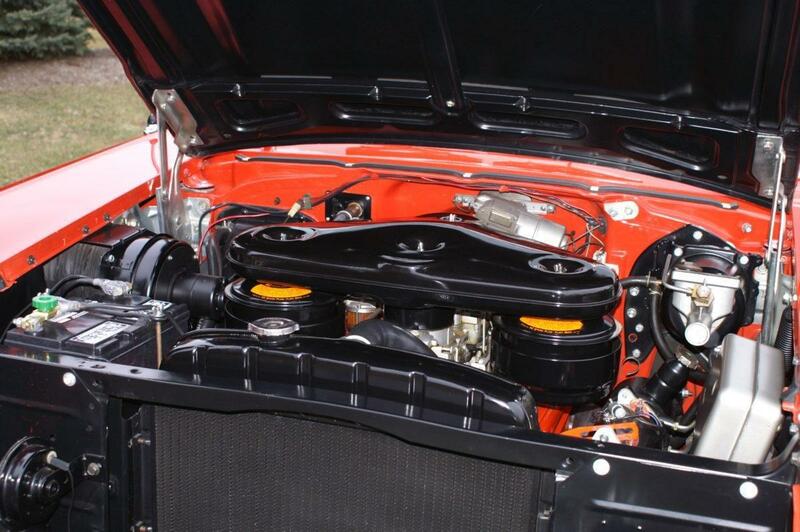 Introduced as a performance engine in 1967, the 350 went on to be employed in both high- and low-output variants across the entire Chevrolet product line. Finally superseded by GM’s Generation II LT and Generation III LS V8s in the 1990s and discontinued in 2003, the engine is still made by a GM subsidiary in Mexico as an aftermarket replacement.